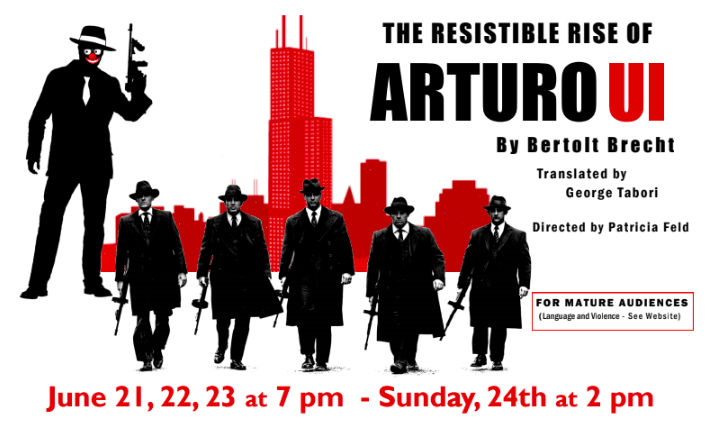 The Resistible Rise of Arturo Ui, written by Bertolt Brecht in 1941, is a satirical look at a small-time thug who, with his henchmen, comes from New York to Chicago to take over the Cauliflower business by offering, for a price, “protection” to small groceries. It is an allegory of Hitler’s rise to power, with characters and events having a direct parallel. It isn’t what you might expect of a 1930s Chicago gangster play. This is done for laughs, with over-the-top vaudeville acting, singing, dancing, and stage antics that keep it moving at a frantic, funny pace. Directed by Patricia Feld and starring (in alphabetical order): Krini Alampi, Greg Anselmo, Nathan Bergstedt, Tom Boland, Bryan Boone, Greta Drewlow, Laura Gillman, Kristi Gustafson, John Hanson, Audrey Johnson, Abe Klamm, Dakotah Klamm, Jack Nachbar, Mike Raymond, Megan Reedstrom, Victor Romanik, Aaron Saude, and Archie Wass. $15 for adults, $5 for students. Available at the Gift Nest, the Timber Rose, online, and at the door. Thanks to Arvig and JK Mechanical for helping underwrite this performance. This activity is made possible in part by the voters of Minnesota through a grant from the Arrowhead Regional Arts Council, thanks to appropriations from the Minnesota State Legislature's general and arts and cultural heritage funds. Rating systems and recommendations can sometimes be difficult to understand. Different people feel differently about the definitions of “adult language” and “adult situations.” In an effort to make things clear and enjoyable for all of our patrons, we have instituted a new rating system. Many of you have asked why we don’t use the rating systems of R or PG-13. Unfortunately, that rating system was copyrighted by the MPAA, and we are not allowed to use it. Many have also asked why we do not cut offensive language or situations out of the script altogether. When we select a script and enter into a licensing agreement, we are also agreeing to produce the script exactly as written. We are not allowed to alter the playwright’s script. We hope that our new rating system will help you make informed decisions about the productions that you want to see. The guidelines we offer are subjective and may not reflect individual sensitivities. To address specific concerns, please contact the Ticket Office directly at 218-743-6670 or admin@edgecenterarts.org. The Resistible Rise of Arturo Ui is recommended for audiences 13 and above because of adult language and gangland violence.